Jason Aldean is co-hosting the 2013 CMT Music Awards with actress Kristen Bell, and he's taking the opportunity to debut his new single. Aldean will perform the title song of his current album, 'Night Train,' live on the broadcast Wednesday night (June 5), and it will be released to radio the following morning. The song is the fourth single released from the album, which has scored three hits already with '1994,' 'The Only Way I Know' and 'Take a Little Ride.' 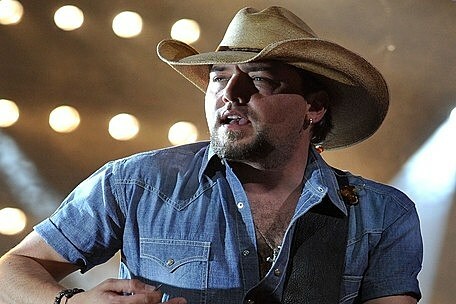 Aldean's fifth studio album debuted at No. 1 in the Billboard charts. It has been certified Platinum. Aldean is also slated to perform a song with rocker Lenny Kravitz on the live program, and he's nominated for three awards, including Video of the Year. "Tonight's going to be a total blast," he says in a press release. "I'm hosting for the first time, I get to perform with Lenny Kravitz, and I get to debut my new single...are you kidding me? I'm going to try my best not to screw anything up and just have fun with all of it. I hope everyone tunes in!" The 2013 CMT Music Awards will air live from Nashville's Bridgestone Arena at 8PM ET on CMT and CMT.com.